Linux is very powerful system. We can see its power with commands. There are few tools which you can use to find the amount of RAM currently installed, number of available DIMM slots for RAM and installed quantity and amount of RAM. Firstly let's use the command "dmidecode". A. Using dmidecode to find the maximum RAM supported by your system and no. of slots for RAM. 1. First Open your terminal program. 2. Type "dmidecode -t 16" without quotes as in the following snapshot. The line 'Maximum Capacity:' shows the maximum supported amount of RAM in my system. i.e. In this computer I can use upto 4GB of RAM. The line 'Number of Devices:' shows the number of RAM slots available. i.e. in my system there are two RAM slots. B. Using dmidecode to find the information about installed RAM on the system. 1. 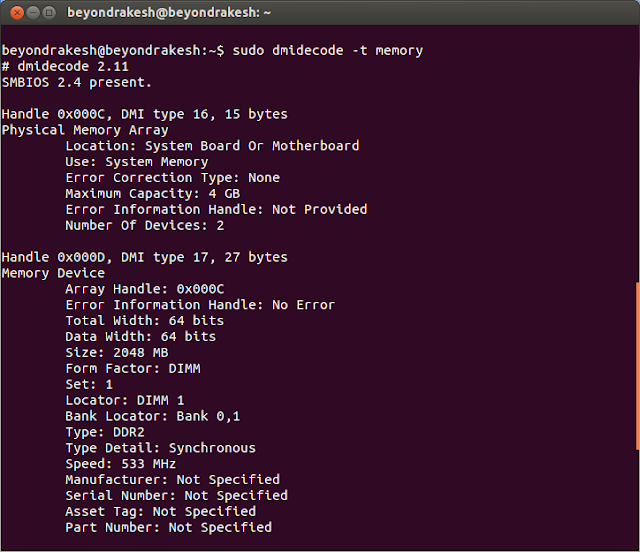 Type "dmidecode -t memory" without quotes as in the following snapshot. 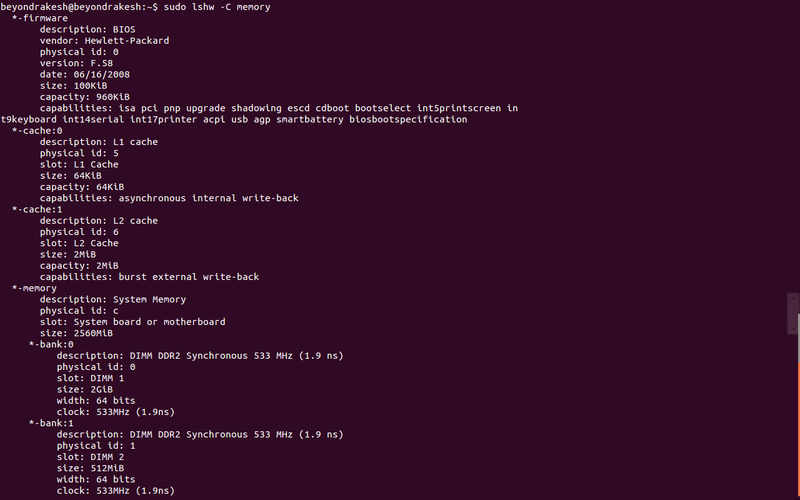 The line "Locator: DIMM 1" shows the information about RAM slot 1. 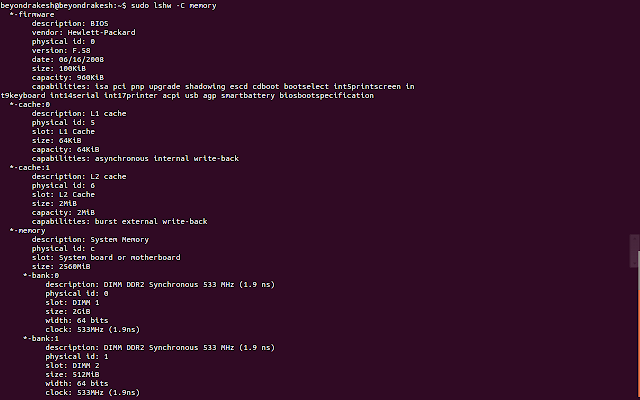 The line "Locator: DIMM 2" shows the information about RAM slot 2. In my system, the RAM slot 1 (or DIMM 1) has 2GB RAM installed and slot 2 (or DIMM 2) has 512 MB RAM installed. The line "Speed:" shows the bus speed of RAM installed on the system. 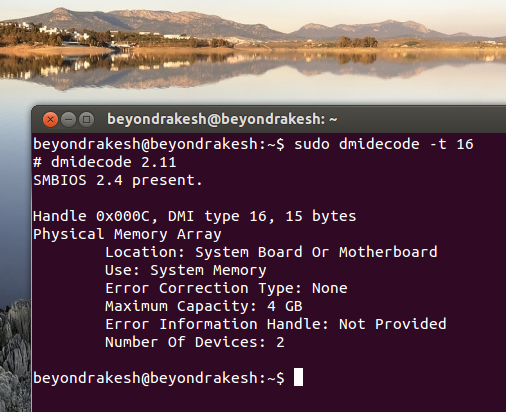 This tool 'dmidecode' relies on the information provided by BIOS. There is another tool named "lshw" which does the similar thing but it scans your system hardware and doesn't relies on your BIOS. In most cases dmidecode's output is enough but lshw's output is comparably more accurate. Let's see the output of lshw. where the 'speed' is referred as 'clock'. where the 'locator' is referred as 'slot'.